Valentines Day is soon upon us and what is more fitting then a love letter accompanied by the simple but much loved gift of chocolate. I’ve created the ultimate vegan chocolate guide, which has something for everyone. 1. Nadalina Dried Figs & White Wine Chocolate Bar – for the sophisticated sweet tooth. 2. Vego Hazelnut and Vegan Milk Chocolate Bar – for the classic, sweet chocolate lover. 3. Vivani 92% sugar free Vegan Chocolate Bar – for the health conscious. 4. Ombar Coconut Raw Vegan Chocolate Bar – for the raw foodist. 5. Atelier Cacao Rose Sugar Chocolate Bar – for the rose lover. 6. Montezuma Vegan Truffle Selection – for the environmentalist vegan. 7. 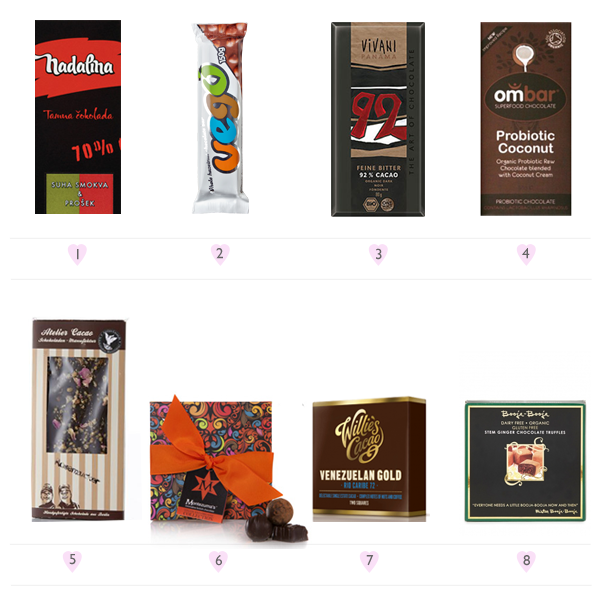 Willies Cacao Venezuelan Gold Chocolate Bar – for the vegan foodie/gourmand. 8. Booja Booja Stem Ginger Chocolate Truffles – for someone who loves the finer, more luxurious things in life.